Geologists has recently discovered a treasure trove of dinosaur footprints in an isolated area of southern Utah. Utah geologists say they have discovered prehistoric animal tracks so densely packed on a 3/4-acre rock site, they're calling it a "dinosaur dance floor." The site along the Arizona-Utah border is offering a rich new set of clues about the lives of dinosaurs 190 million years ago. Back then, large stretches of the West were a Sahara-like desert. More than 1,000 tracks were found in what would have been a watery oasis nestled among towering, wind-whipped sand dunes. Those footprints could provide fodder for future researchers trying to understand dinosaurs that survived in what many considered a "vast, dry, uninhabitable desert," said Marjorie Chan, professor of geology at the University of Utah and one of the authors of a new study of the site. "Maybe it really wasn't as lifeless as we think," Chan said Monday. 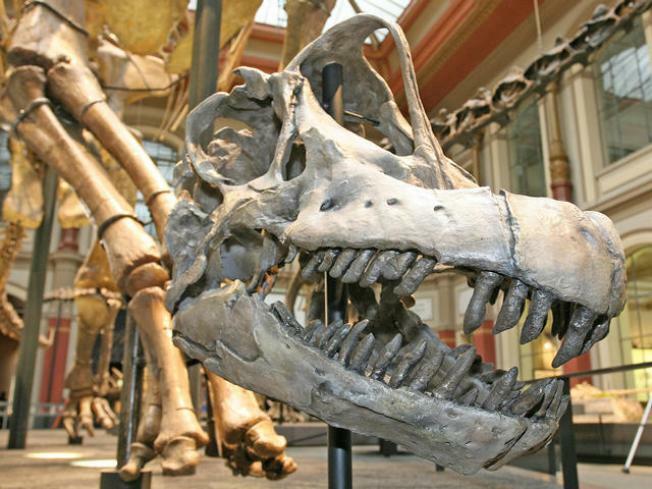 The discovery adds yet another site to the region's long list of dinosaur hot spots. The difference, though, is sheer numbers. Scientists estimate there are more than 1,000 — and perhaps thousands — of tracks at the site, which is in a protected area of Vermilion Cliffs National Monument. In some places, there are a dozen footprints in a square yard. "It was a place that attracted a crowd, kind of like a dance floor," Chan said. Researchers identified four different kinds of tracks in the rock but haven't determined the specific species that left them behind. Some of the footprints — once thought to be potholes formed by erosion — measure 16 inches across and have three toes and a heel. Others are smaller and more circular. The area also includes what researchers think are rare tail drag marks. Winston Seiler, who studied the site for a master's thesis, said the area may have been a popular gathering spot for adults and youngsters alike. The location may have been one of many where Early Jurassic dinosaurs stopped for refreshment before moving along. Seiler imagines dinosaurs were "happy to be at this place, having wandered up and down many a sand dune, exhausted from the heat and the blowing sand, relieved and happy to come to a place where there was water." The study's findings were published in the October issue of the science journal Palaios. "It's an exciting site and deserving of a lot more work," said Jim Kirkland, Utah's state paleontologist, who was not involved with the study. He's hoping paleontologists begin a large-scale survey of the site to better understand what's there and what stories the tracks might tell. Dinosaur tracks can provide important insight about dinosaur behavior and movements across the landscape, said Andrew Milner, paleontologist at the St. George Dinosaur Discovery Site at Johnson Farm in southwestern Utah. The newly discovered site, about three miles from the nearest road, is part of a protected wilderness area that also includes a much-photographed geologic formation called "The Wave" — a gallery of striped, twisted sandstone. Twenty permits are issued each day to enter the area. Linda Price, the monument's manager, expects interest in the area will jump with word of the dinosaur track site. "I'm thinking this could be just as big as The Wave," Price said. "It's really, really cool."